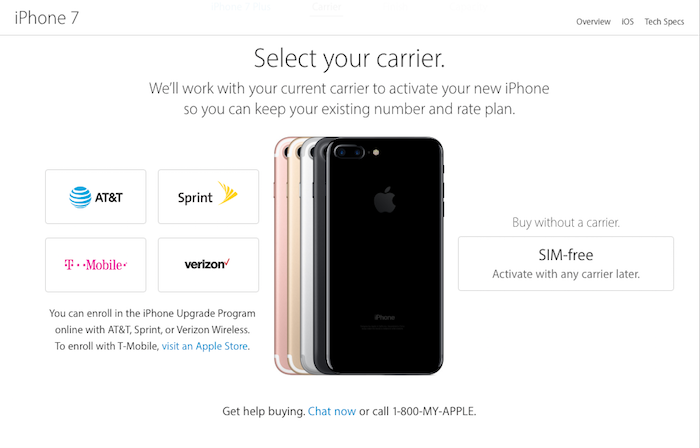 I checked today and it looks like you can now order the SIM-free iPhone 7 and iPhone 7 Plus from the Apple Store at apple.com. When you click on buy for the iPhone 7 you first need to choose between the iPhone 7 or 7 Plus. Next, you’ll need to select your carrier and on the left, you’ll see the options for AT&T, Verizon, Sprint and T-Mobile but on the right you will now see the option to buy the SIM-free iPhone. It also say you can buy and without a carrier and activate with any carrier later. This is great news because if you want to buy an iPhone 7 or iPhone 7 Plus to use with a prepaid wireless service like Straight Talk, Tracfone, Net 10, or Verizon Prepaid the SIM-free model is the one for you. The SIM-free iPhone 7 is compatible with any prepaid wireless service that use the AY&T or T-Mobile networks. The SIM-free iPhone 7 is compatible with the Verizon network. You should be able to use it with any prepaid wireless service that uses the Verizon network, but when you get your iPhone you’ll have to check the serial number or IMEI of the phone to make sure you can register it on the their network. I have done this in the past with my SIM-free iPhone 6s and iPhone 6 so you should be fine. If you want to use the iPhone 7 with a prepaid wireless service that uses the Sprint network, check with your wireless carrier. Typically you need a SIM card from Sprint to use a phone with a prepaid wireless BYOP plan. You may be able to buy a full price Sprint model phone and use that phone and SIM. Again check with your carrier. Unlike the iPhone 6 and 6s, if you want a phone that is compatible with the AT&T, Verizon, and T-Mobile networks you want the SIM-free model. The AT&T and T-Mobile model iPhone 7 doesn’t work with the Verizon network. I also noticed that while you can order the SIM-free iPhone 7 or iPhone 7 Plus today, the phone isn’t currently available for in-store pickup. This means you cannot order online and pickup at the store later. I checked apple.com and I found that if I try and order a SIM-free iPhone 7 Plus the expected delivery date is in November. For the iPhone 7, the delivery date was between Oct 18 and 20. If you are trying to buy and iPhone 7 for AT&T, Verizon, T-Mobile or Sprint, there seems to be plenty in stock to buy online and pick up in store today. You can check in-store availability for a carrier model iPhone 7 Plus, they currently don’t seem to be in stock for store pick up. A few people have been asking me about this on smartphonematters.com, so I’d thought I’d share this. I’m not currently planning to buy the iPhone 7 yet, what about you? Leave a reply below and share.